I would like to share with you an article about pain and how you can work with it to get really great results. 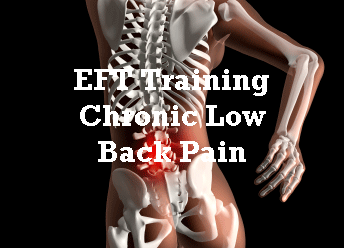 Chronic pain is something we commonly deal with on my EFT Training courses. I have written many articles on the work that I have done on it. Shoulder, etc articles. Chase the Pain is a specific approach in EFT (Emotional Freedom Technique) that targets, how you know you have the problem, for example, you might have a “deep throbbing pain sensation inside the left hip”. These words are then used in the tapping process to keep the mind tightly locked onto the problem. EFT tapping works best the more specific you are, so using a tight description like this, allows you to be very specific about your particular issue. Chase the Pain gets amazing results. Rani attended my EFT Training (See Rani and other videos by Tania on YouTube). Like so many of the people who attend, she had a personal reason as well as wanting to explore how to use it with other people. Rani had a chronic pain issue. She volunteered for me to work with her in front of my trainees using the, Chase the Pain technique. In the video below you can see Rani demonstrate the improvement she experienced after EFT. Over Twenty years ago Rani was injured during a fight whilst on duty as a police officer. The damage was severe. It was thought at one point after this trauma, that she would not be able to walk again. She had multiple surgeries. Rani did not want to accept the limitations placed on her by the medical profession’s diagnosis. She was determined to regain her fitness. With this determination she was able to regain her mobility. However she was left with a constant chronic low back pain and her movement was massively restricted. She was barely able to move her head to the side, and her lower back had serious physical problems. She could not exercise much and was able to only slightly bend forward from the waist. it was impossible for her to bend forward much let alone touch the floor! Many students ask, does EFT last? The answer is that in many cases is that it does. However sometimes the pain comes back, in which case there is a reason for that. With EFT we simply then target it further and work with other related issues. After the training Rani had remained almost pain free for 2 weeks (a small bit of the pain had not cleared on the training. Demonstrations on courses always have a limited time, because of the need to allow the trainee practitioners to practice. This is different from a clinical session. Given more time it may well have been possible to clear this further). It is important to realise that the fact that she had experienced such an enormous improvement is fantastic. To go from such intense pain to pain free with just a slight discomfort after 20 years is astonishing! However the pain then came back, not fully, but still intense. She was able to use EFT to manage it by again tapping it out using Chase the Pain. She was able to alleviate it. It is important to note here that prior to attending the EFT training she had attempted to use EFT on her problem without guidance, just using information that is freely available to her from another practitioner. She had targeted the emotional aspects. The result of this was that her emotions around the trauma related to the injury and the subsequent years of distress were not as intense as they had been, but it never touched the pain aspects. The Pain Came Back – Where do we go from here? Discussing possible interventions with Rani, I asked “what was happening when the lower back pain returned?” She said that she was on holiday and had visited war graves. Umm- definitely a potential event that can trigger big emotions. The way she described her experience here may to her seem a positive experience, but there was definitely emotion attached to this for her. The mind/body system works via association. So, the mind/ body system could certainly draw parallels here, considering her trauma and its impact on her life. It would certainly have been a possible direction to go with the EFT. There are other emotional events in Rani’s life which are related to family, this was another direction. However, I wanted to know about the original trauma and post trauma experiences to make sure they were no longer impacting her. This to me seemed a very basic step to take before moving on and looking for other things. To evaluate whether her mind/body system had completely let go of these traumatic events in her life, I asked her about them. Her emotions were not that evident, but how we hold memory isn’t just about emotion. What visual memories etc did she hold? She still had clear memories of the trauma and the events that followed. This was clear indication this was not fully dealt with. The mind/body system does not hold memory in this way when it has fully processed it out. So, although she didn’t experience that much emotion around the events, they were very definitely still impacting her. Understanding how the mind works is key to being highly effective using EFT. It isn’t just about tapping. There are degrees of tapping and clearance. To get powerful results you need to tap things thoroughly out to the deepest level until the person has a total change in perception around the issue. She was not truly at a complete perceptual change. She could still clearly see a highly traumatic event and its consequences in her life. When dealing with trauma there are often key moments within the experience. For example, Rani was in the fight. This might not be the most traumatic element of this. There is also a moment of realisation that she couldn’t run. This is a shocking moment. A very key moment, that needs to be cleared using tapping. Of course after this there are also further moments of trauma. To minimise any discomfort we initially used the movie technique to deal with the moment of realisation of, not being able to run. We also cleared the fight. And in Rani’s own words, the “sh** load of rubbish!” (it is important to use the persons real words that describe how they think about their problem. To change these to make it more politically correct or polite, can water down the results. Real therapists, go with the client:-) They do whatever they need to do to get the result!) The important point to realise is that these words encapsulate a huge amount of trauma and have the potential to rapidly clear it. During the whole of this trauma clearing we checked to see what was happening to the physical lower back pain and the physical symptoms of the problem. With each aspect we cleared from the trauma the pain changed and released. This shows the impact of trauma on the physical problems that Rani was experiencing. This is not unique for Rani, it is also true of other people’s problems. At this point during the session Rani came up with a metaphoric description of her problem. We tapped using the words that represented Rani’s metaphor. When imagery such as black clouds etc come to mind, realise the unconscious mind encapsulates a lot of issues within this type of visual representation. Tapping through a metaphor, there is the potential to clear a huge amount of issues. It is a beautiful way of working. By the end of the session which lasted about an hour, we had for the most part cleared some substantial trauma. The initial traumatic moments such as the fight and the moment of realisation that she couldn’t run were no longer vivid memories instead, that were near impossible to pull back in any format. You have to realised just because something has happened to you does not mean that the emotions or the memory need to stay with you. You can release and let go if it and think about it in a way that truly is more conducive to your health and well being. By the end of the session, the pain was gone. Will it remain gone? I don’t know. ( I haven’t as yet worked out how to see in to the future – but I’m working on it:-)) All we truly know is that we worked on the trauma. As we did that the lower back pain went and the other sensations. Rani is now evaluating this over time. I have asked her to do some basic blanching by just tapping on the EFT points. During the session Rani did a lot of yawning. This generally indicates a releasing is occurring. My guess is that the mind was still processing out what we had worked on. The effect of EFT does not finish at the moment you stop tapping. When we go to bed at night the mind/body system naturally completes processing out uncompleted stuff. So, it will be interesting to see how she goes over time. Thank you to Rani for agreeing to play with me on clearing this:-) I intend to give the recorded session to my students to help them master EFT. If you would like to receive information on the EFT and other training courses by Tania, please fill in the form below. Please Note: The above information is for educational purposes it does not guarantee that you will receive the same results as Rani.